Strong winds can rip the tiles right off a roof, whether it is a new model home or older. With these tiles being ripped off, it the roof deck or even old tiles from a previous roof are left exposed. Not only do high winds affect a roof, but you need to keep in mind that even day to day winds can cause wear to tiles overtime. The size of the hail and the wind direction plays an important role when it comes to the damages it can cause. Hail can dent and degrade tiles or other roofing surfaces. When these dents occur, the granules that protect against rain and sun damage are dislodged. Rain is another element that affects roofs immensely during a storm. With the added strong winds, water can penetrate a roof, which could lead to damage and mold growth. Even the smallest trees and branches can cause damages to your roof. The branches from trees can poke holes in your roof, making the area vulnerable to water damage. 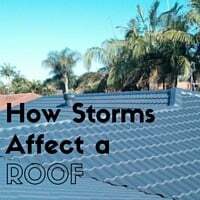 The first thing to keep in mind when it comes to your roof after a storm is that the damage may not always be obvious. And when the damage goes unnoticed problems can occur weeks and even months after the initial storm. So, if you live in the Newcastle or Central Coast region and you want to be sure you don’t have any hidden damages, have your roof inspected by a contractor. Here, at Rooftec, we ensure you that we will get the job done right and at a reasonable price!